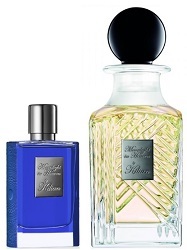 I've never owned a By Kilian cologne (I like fragrances from the line, but never enough to commit to a bottle); as you can guess, Moonlight in Heaven won't be taking up residence with me either. For a mango fix I'll order a case of Alphonsos and spray on some vintage Annick Goutal Folavril. By Kilian Moonlight in Heaven Eau de Parfum is available in 50 ml ($285, refill $185) or in a 250 ml carafe bottle ($720). *The fragrance notes include lemon, grapefruit, pink pepper, coconut, milky mango rice, tonka bean and vetiver. I’m always sort of relieved when something as pricey as By Kilian turns out to be kind of boring. . . The first I heard of Alphonse mangos was in the Vikram Seth novel A Suitable Boy. They are a minor obsession there, and I hope some day I’ll get to taste what the fuss is about! It ranks among my favorites, but I can certainly see why it would be difficult to finish. It’s one of my short-list favorites, too. I think it bogs down in the middle when Maan is banished to the hinterlands with his tutor, and the author indulges in some excruciating detail on the birth of Partition. I skipped a lot. But good news! “A Suitable Girl” looks like it may finally be released soon! As someone weaned on humorlessly detailed fantasy novels and with kiiiind of a crush on Nehru, I didn’t mind that excruciating detail on Partition as much as a reasonable person would. I have hope for ASG’s arrival, but I’m pretty sure Seth is waiting for me to finish my dissertation to publish. Sorry! I promise it hasn’t been that long (on my end), I’m working on it. Neither did I. I loved “From Heaven Lake” and “The Golden Gate,” but lost my stamina for “Suitable Boy,” one of the only books I started and did not finish in my life. I have a Vikram Seth story though– well sort of. Nearly 30 years ago I met his brother, a Buddhist monk (he was at the time), in Delhi and he asked me to give him a tour of a visiting exhibition of Impressionist paintings. So we spent the day together visiting the museum and talking about western art. He was very gracious. I was fresh out of college and insanely flattered by his interest in my opinions. Ajf, they are fantastic…order some! Love mango sticky rice dessert. Uh oh, now I’m hungry! Thanks for another reason to look forward to springtime Kevin ???? I’m a bit bummed that you don’t like it, bc the combination of notes sound wonderful. If I like it, I’ll have to forget that you said it was boring. ???? Laura…hey, you can always forget what I say…if you like it, who cares! I too love Alphonso mangoes (and just learned that mangoes plural has an “e” in it– lesson for a bad speller!). I only know one mango scent, Bombay Bling–from your description it sounds like the BK scent is nothing like BB–but that just makes me more curious. That is curious but not pining! Oakland, I want a more foghorn, fun type mango…hope some house will oblige. Kevin, the mango and sticky rice you described sounds totally mouth-watering. Too bad the perfume didn’t meet that high standard. jalapeno: of course if someone gave me the choice of eating dessert or wearing perfume..I’d eat. My favorite mango fragrance is Bombay Bling. Might need to wear some tomorrow to combat vet office aroma! Sapphire: I’ll have to refresh my memory on Bombay Bling…so many years since I reviewed/wore it. I liked the mango in that better than in Moonlight..and I forgot all about Hermes Un Jardin Sur le Nil’s nice mango, too. I loved all the Calice Beckers in the BK L’Oeuvre Noire Collection and her first two ouds (Pure Oud and Rose Oud). Nothing since then has appealed to me at all! I think it was their shift in focus to Asian markets, where even lighter perfumes are preferred (not that BK ever did heavy fragrances). Sadly (or fortunately for the credit cards), this coincided with the introduction of the beautiful snake clutches, which would otherwise have been a great temptation. noz: I’ll have to look at the snake clutches…off to the By Kilian site. I love Alphonso mangoes too. And I also found this perfume unremarkable. And I would second the suggestion of having another sniff of Bombay Bling – love that one though it is full on fruity. dona: I’ll come across my BB sample…eventually! ha! Fils de Dieu will always be my perfume Thai kitchen. Slightly savory notes, jasmine rice and that hint of “curry” (may very well be my imagination at this point…who knows? I am HUNGRY.). Maybe I will try to obtain a sample of this and layer them together or Kevin, if you happen to have Fils de Dieu maybe do that and see if anything delicious happens? A mango scent that I like that is realistic: Fruit Défendu by Terry de Gunzburg. happy888: Fils de Dieu wasn’t a fav of mine…I don’t remember getting a ‘curry’ vibe. I’ll smell Fruit Defendu next time I’m in Barneys. Gosh…I wish I could remember a great Thai food scent Robin here at NST sent me several years back. Will have to look at my buy list…I put it on it. HA! Oooh! I would love to smell (obtain!) a good Thai food scent. If you do find the name, can you put it here please?